Visione, a Midcentury Photographic Memoir is a first edition hardcover, published in 2015, with 63 beautiful black and white images, captured around the world, with emphasis on Italy, the UK and New York. The following quotation is from the Introduction to Visione by Brooks Jensen, Editor of LensWork. This book is filled with life: moments, people, expressions, activities, gestures, and the very stuff of life. It is the life in these pictures that makes them so interesting, while simultaneously being a testament to the photographer’s sensitive eye and skill with the camera. This collection rises far above personal snapshot and touches something universal about the human spirit. In the back of the book, there are some contextual commentaries for the images in English. Sole e Ombra / Sun and Shadow is a first edition hardcover, published in 2000, with 80 beautiful black and white images of Italy. This captivating body of work will pull you into another realm, a time of simplicity and beauty. The images in this book express the feeling of a culture – the social DNA that defines the interaction of people and their environment. They are not only the expression of life in a particular country at a particular time, but they also narrate simple and powerful stories, expressing the fundamentals of human experience. In the back of the book, there are some contextual commentaries for the photographs in both Italian and English. 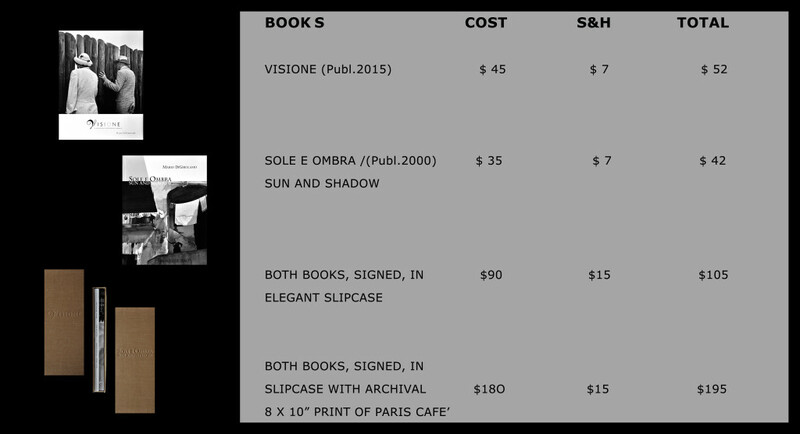 Please indicate in CONTACT your interest in purchasing book(s) and/or prints. You can pay via personal check or PayPal. © 2015 Mario DiGirolamo. All rights reserved.